South-western part of Muller Plateau contains unique natural monument – the 100 km² large Mamo plateau which is covered with more than hundred giant hollows, often located close together. Some of these hollows – caprock dolines – are more than 1 kilometre wide and some – several hundreds of metres deep. These hollows have been created by karst processes and nowhere else in the world this process is that impressive and expressive. Mamo plateau is extremely impressive natural formation. Surface of this plateau is located approximately 2100 – 2700 m above the sea level. To the south it ends with spectacular escarpment – at some points rainforest covered cliffs rise even 1,3 kilometres above the valley of Yu Nali and canyons of some other rivers. To the north from Mamo plateau are somewhat higher hills with several river valleys. These rivers disappear below the plateau and appear far below it, at the middle part – base of the spectacular escarpment. 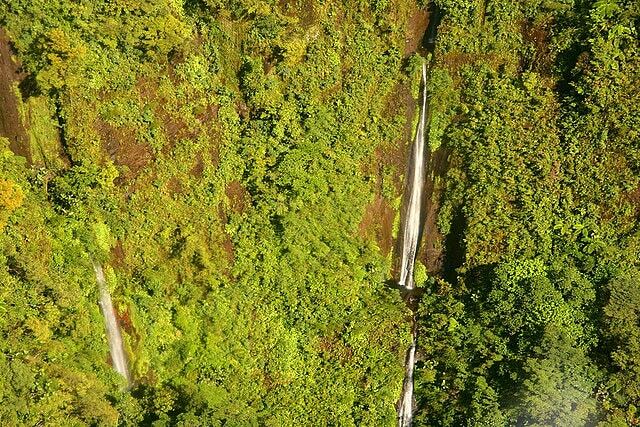 Theoretically the landscape here could have been even more impressive – if the plateau would consist of pure limestone, we could see here fabulous sinkholes with vertical walls and roaring rivers below – may be even more impressive than in Nakanai Mountains in New Britain (see Minyé sinkhole and Naré sinkhole). But, alas, some (unfortunate – from the standpoint of Wondermondo) geological peculiarities have prevented it. Mamo plateau consists basically of Darai limestone formation. This limestone formation is approximately 1.4 km thick and has formed at the bottom of ancient sea in upper Oligocene – middle Miocene, some 25 – 14 million years ago. Above this limestone there is Lai formation consisting of siltstones and mudstones. Also the 1.4 km thick Darai limestone is not pure – it contains smaller layers of clay and other insoluble rocks. Over the last millions of years these rocks were uplifted – rised high above the sea level. This rise continues per some 2 – 3 mm every year. During this uplift the rocks were folded and faulted, there appeared a network of fissures. Thus there was created fine scene for karst processes. Rainfall in the cooler Muller highlands is extremely high – possibly around 11,500 mm per year, like in wettest places of the world. Rainwater penetrates the network of fissures in limestone and seeps down until it reaches some impermeable layer – remember, Darai limestone has such layer! Thus here formed underground rivers which basically cross Mamo plateau from north-east to south-west. Powerful rain creates here powerful rivers and these rivers need huge passages. Naturally, after some time in one or another location there form giant underground voids, which after some time collapse, creating huge dolines. Sometimes these holes are washed out along the fissures from above. If the limestone would be pure, we would see groups of separate giant holes in the ground – along the path of the underground river. But limestone here is NOT pure and there is layer of impermeable rocks. Thus here happens something else – as the underground river manages to collapse its roof, the stream is blocked by impermeable rocks. Water always finds a way and after some time next to the old collapse there forms a new one. It again blocks the underground river but river agains finds a new way. This basically is the way how more than 100 giant "holes" in the ground have formed, covering nearly whole Mamo plateau. Such collapses which are laid out with impermeable rock (here – siltstone or claystone), are called caprock dolines. Contrary to dolines, these holes in general do not have vertical walls and they do not have rivers at the bottoms, appearing from cave opening in one side and disappearing into another side. Collapse dolines are covered with thickets and rainforest and at their bottom often form small lakes. Largest depressions here are 600 m across – and their volume may reach even 31 million m³ – they belong to the largest dolines of the world. But as a rule the larger sinkholes here have gently sloping sides, while the smaller ones often have even vertical cliffs. Some of the first expeditions to this uninhabited area took place in 1973. They were organised after there were noticed numerous "holes" in the ground from airplanes – speleologists had a hope to find new, exciting caves here. After the inspection of several sinkholes their expectations were not fulfilled. 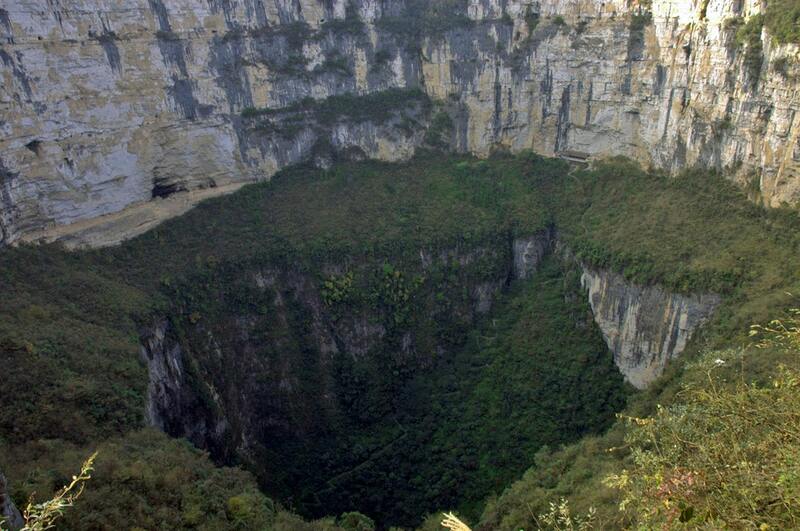 Only in the south-eastern part of plateau there is something what resembles real dolines – sinkholes with vertical walls which serve as entrances into the caves. Volume of one such doline is approximately 1 million m³. At the base of it there opens entrance into cave named Uli Malemuli. This cave together with doline reaches depth of 420 m. Several smaller streams now fall as waterfalls into this sinkhole. In this part of Mamo plateau was found the longest cave in Papua New Guinea – the 54,800 m long Mamo Kananda Cave. Most likely after some time the giant halls of this cave will collapse, adding several more caprock dolines to the rich collection of dolines on Mamo plateau. Sinkholes of Mamo Plateau form unique landscape and there is nothing similar elsewhere on Earth. Most likely this weird plateau hosts also unique species of plants and animals. James J.M. Giant dolines of the Muller Plateau, Papua New Guinea, Speleogenesis.info. Accessed 25.07.10.